Hi! 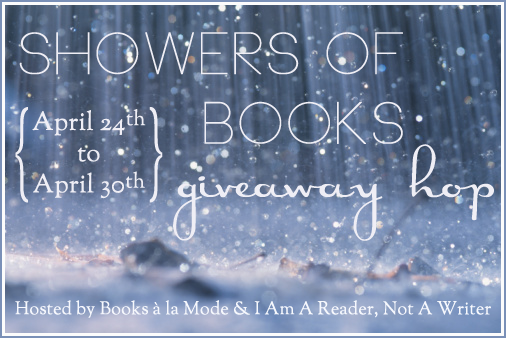 Welcome to my stop on the Shower of Books Giveaway Hop hosted by I Am A Reader Not A Writer and Books a` la Mode. 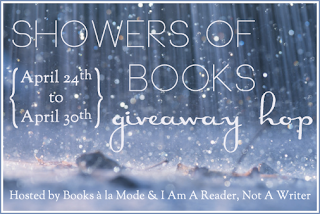 With this giveaway I literally wanted to "shower" the winner with books so I decided to do something a bit different. I decided to give away four of my favorite novellas to one winner! I love novellas that accompany some of my favorite series and I wanted to share them with you guys! So one winner will win eBook copies of Elixir, Iron's Prophecy, Destroy Me, and Flirting With Maybe! Thanks for the giveaway! I haven't read any of those books yet, so thanks for a chance! I must say, I like the variety of the prizes! Thank you heaps for the giveaway, some great prizes here! Awesome giveaway! Love these series and usually never buy novellas, great idea! Thanks a lot for the giveaway! I love Spring. It's when the cold and ice of winter melts away and flowers begin to bloom. The grass becomes green again. The birds chirp in the trees. And the weather warms, which is probably the very best part! So far, I have experienced many April showers. I can't wait for their inevitable consequence: flowers! All books was great!! Awesome giveaway!! Thanks for the giveaway! I think it's a great idea to give away a set of popular novellas for this! thanks for the giveaway!! I havent read any of them.. Thanks for the great giveaway! Excited to read Elixir!